On April 23, 2018, Governor Cuomo proposed a straight ban on plastic bags. The catch? "Straight" plastic bag bans only ban plastic bag use without addressing other types of wasteful carryout bags. Banning only plastic bags isn't nearly as effective at changing consumer behavior as laws that include bag fees. The other catch to Governor Cuomo's bill? It would preempt all local fees on carryout bags. Blocking fees on carryout bags would dismantle the most successful local legislation in NY state, including a 5-cent bag fee in Suffolk County reduced the number of consumers who used single-use plastic bags by 41 percent in the first year and New Castle, NY’s ban-fee hybrid that led to 1,500,000 fewer bags being used in 2017. Straight bans on plastic bags have been tried across the country in San Francisco, Chicago, Honolulu, and several communities in Suffolk County, NY. In each case, these communities found that a ban alone wasn't effective and later added a fee component, which made for laws that dramatically reduced overall carryout bag use. The evidence is clear—comprehensive carryout bag legislation is the most effective way to reduce waste from shopping bags. New York should learn from other communities and implement an NY #BYOBag law that includes a fee. That’s why it’s time to give Governor Cuomo a call and demand that he revise his proposed bag bill. What can you do to help? On June 6th there will be the Bring Your Own Bag Call-In Day. We encourage you to call Governor Cuomo and voice your concern for our environment and support of Senate Bill S7760 and Assembly Bill A9953 which would ban single-use plastic bags and put a 10-cent fee on paper bags. To get involved, save the Governor’s number 845-943-4749 to call on June 6. See the Facebook event for more details. The call-in corresponds with a day of action taking place in Albany in which sustainability organizations from around the state will be delivering a letter co-signed by over 100 advocacy groups statewide to Governor Cuomo urging him to take action by passing S7760 and A9953. Legislation that supports sustainable habits like using reusable totes instead of plastic is crucial in the fight against climate change and there is so much you can do to help. 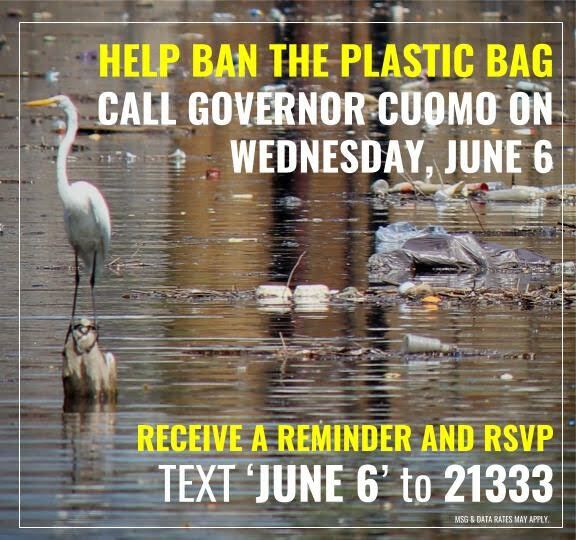 Calling on June 6th will make your voice heard and let Governor Cuomo know that a straight ban on single-use plastic bags is not satisfactory, New York needs a comprehensive carryout bag law.